The choice of an oak entry door for this setting simply makes sense. The rich colors and patterns of the oak door are striking, even when seen from the middle of the room in this photograph. Oak is legendary for its ability to hold stains that bring out the natural ring patterns with the power to warm up every room. 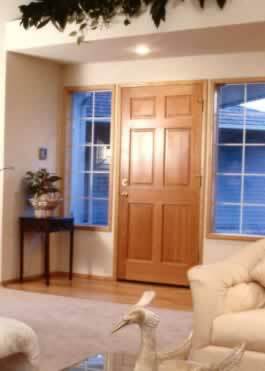 The use of off-white in ceilings, walls, flooring, and furnishings creates the front door as a focal point of interest. Meanwhile, the use of multi-lit windows to frame the door creates additional focus on the oak workmanship. Light flows into the dwelling around the door, and internal spot lighting brings out the natural designs in the six-panel door. There's no need for ornamentation. The total effect is one of strength, simplicity, and allure.